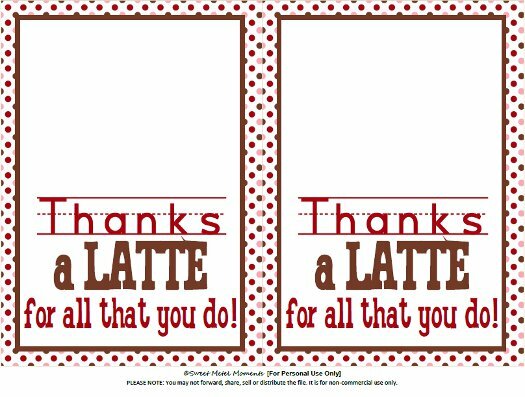 Sweet Metel Moments: Free Printable - Teacher Appreciation - "Thanks a Latte"
Free Printable - Teacher Appreciation - "Thanks a Latte"
For Day #5 of Teacher Appreciation Week, Brody is giving his teachers a Dunkin Donuts gift card attached to a 5x7 greeting card that says, "Thanks a latte for all that you do!" This printable was inspired by this project on Eighteen25 that I absolutely adored! But since I didn't have all of the supplies to make their version, I decided to make my own version. Download your own free printable by clicking the image below or HERE. Then use a ribbon in a coordinating color, I chose orange, and tie a pretty bow. And now you have a cute gift to somebody who loves coffee! I made this for Teacher Appreciation week, but don't forget that Mother's Day is right around the corner. This gift is sure to make any mommy smile! I'm sure the teachers loved this! This is too cute. When I downloaded it, the "thanks" is just a bunch of lines. Any suggestions? Thanks for your comment and visiting my blog! Thanks for the tip. I originally opened it on my iPad, but then tried on my laptop which worked fine! I was searching for something just like this!! Thank goodness for talented people like you!! Thanks for sharing!! You're welcome! I'm so happy to share this and for people to find me who can use it! Thanks for visiting my blog! When I try and download the template it says the host is out of bandwidth? I'm experiencing the same problem - error message saying host out of bandwidth! Is there any other way to download the file? Since my printables are uploaded on a free file sharing site, I only have a certain amount of times that they can be downloaded. Due to the popularity of these printables (this printable alone has had over 24,000 downloads! ), I reached my maximum amount of downloads for the month. It should be reset next month and can be downloaded again. Sorry for the inconvenience, and thanks for your patience! Also, thanks for visiting my blog! Did anyone by any chance save the template? Or perhaps you can tell us how to scale it? I was able to create a PDF of the image but I want it to look right when I print it if that makes sense. Thank you for sharing this file! This is so cute!! I printed this out today and attached it to two small packets of coffee for each of my daughter's teachers. She started Kindergarten yesterday and as a former teacher, I would have loved this as a "back to school" gift! You're welcome! I am so glad you were able to use this printable for a back to school gift! I hope your daughter has a wonderful Kindergarten year! Thank you so much for visiting my blog!